This high-performing mains cable showcases 0.3mm diameter silver plated copper wires, rubber insulation and robust connectors to ensure a clean and strong sound performance. Black Rhodium Fusion Mains Cable is one of the most popular mains cables offered by respected British company Black Rhodium. This relaunched product showcases an improved sound performance and updated sound quality terminations in keeping with the brand's cutting-edge spirit. Fusion mains power cables showcases 19 stranded cores of 0.3mm diameter silver plated copper wires, which enables it to be used not only for with high current equipment such as Class A amplifiers, but also for power distribution to a whole music playing system from the wall sockets. Fusion mains cables are designed to provide super clear diction and separate musical instruments brilliantly through a dramatic reduction of ‘Transient Phase Distortion’. ‘Transient Phase Distortion’ is minimised by utilising thicker insulation than is usually found in cables, increasing the distance between conductors. This move lessens the magnetic field seen in each conductor wire, as a consequence of the magnetic field generated by the current in the other conductor wire. As a result, you can enjoy a purer and more expansive sound quality. Three silver plated copper cores for positive and negative signal flows and earth are used by Fusion mains power cables and the positive and negative cores are connected in opposing directions. Experience demonstrates that when cables are connected like this, you can enjoy a lower noise floor. This creates more intense silences in the gaps between notes and sharpens musical edges and natural decays in music. 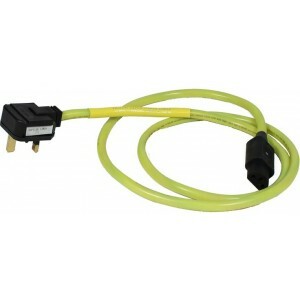 The Fusion Terminated Mains Power Cables is fitted with high-quality connector specifically selected for their sturdy properties and superb sound quality. Special measures have been taken to limit mechanical vibration and RFI in the designing of the connection between connector and cable.